As many as 63 children have died in a span of five days due to shortage of oxygen at the state-run Baba Raghav Das Medical College hospital in Gorakhpur. However, the Uttar Pradesh government led by Yogi Adityanath has emphatically stated that no child died from paucity of oxygen. It has, however, admitted there could be negligence and ordered an investigation. The chief minister, Yogi Adityanath, had visited the hospital on August 9. It has come to light that the shortage in oxygen supply was owing to non-payment of dues to the company, Pushpa Co., that supplied the gas. The company had been supplying oxygen on humanitarian basis as they did not have a fresh contract. A whopping Rs 70 lakh had been pending for payment. The tragedy has also set off a war of words among the various political parties. Will those responsible be brought to book? 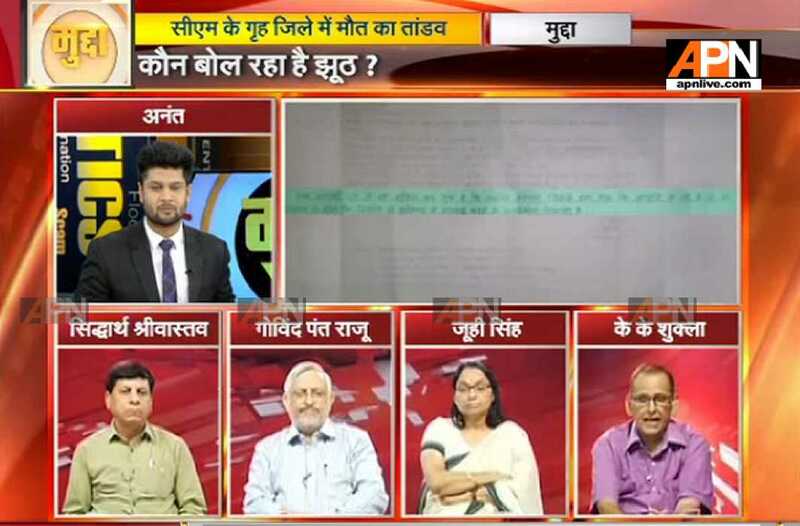 Mudda, the daily current affairs show on APN channel of August 12, discussed all the aspects of the issue in detail. Moderated by Anant Tyagi, the debate saw as participants BJP minister KK Shukla, SP leader Juhi Singh, Congress spokesperson Siddhartha Srivastava and social worker Prince Lenin. “In my view, this is a clear case of corruption. Whosoever is found guilty in the tragic incident will certainly face stringent action,” he added. But the SP held the UP government squarely to blame. Significantly, Yogi Adityanath has been MP from Gorakhpur for the past 20 years. “Despite knowing that each year, several adults and children die from the Japanese encephalitis virus, the government did not prepare to tackle it. Families of the deceased were sent off with the bodies, even without a postmortem,” he said. Srivastava, too, took a swipe at the Yogi, and highlighted the fact that though several local media houses were publishing the news about the lack of liquid oxygen in the hospital for the past few weeks, the BJP government had turned a blind eye. Raju wrapped up the discussion, saying the heartwrenching incident still shows up the UP government for its callousness to the people’s suffering and utter negligence towards duty.